A young "knight" wishes more than anything to join the other warrior knights who are busy fighting dragons. 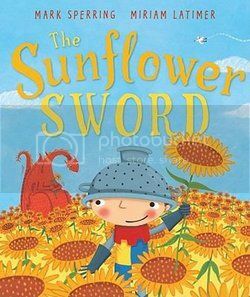 He begs his mom for a sword... but she gives him a sunflower instead. He decides to make the best of it, whooshing and swooshing the sunflower to and fro. Bright, cartoon-like illustrations feature the little boy's haphazard outfit, including a dagged tunic, a colander helmet and shoes that look more like cowboy boots than medieval wear. The mother's floral nightgown and whimsical scarf make her appear decidedly modern, inviting readers to wonder if the whole story takes place in a his imagination. After meeting a real dragon, who mistakenly thinks that he's offering a gift, they accidentally broker peace. Soon all the knights are rushing to the hilltop, bringing offers of flowers, hoping for dragon rides. I almost wondered if this would turn into a bit of a love story... as the little knight offers the dragon a sunflower, her tail takes the shape of a heart. I love finding little details like that in the illustrations. Observant readers will note a small white dove that appears on every page, emphasizing the message of peace.